How many hours, how many emails, how many years? Yes, years from start of the CD idea to CD in hand. In order to make the best CD, I needed to be ready, and so did the material. This is a storytelling CD, but the same could be said for music, you have to be ready. There is the honing of your skills to a certain level and then learning and practicing the pieces. Well that’s the tip of the iceberg! From there it was into the studio for recording sessions, it took several sessions to get what we needed done. www.suiteaudio.com was where I worked and I was very pleased with the engineering by Bob Nary and his adaptability to recording spoken word. A story without an audience and told in the limited studio space takes some tweaking. I am accustomed to certain movements and moments when I wait for audience response. Those moments were not there and so there were gaps that needed to be tightened up. There were a few phrases that relied heavily in performance to my body language, those needed some new wording to work in the world of audio. That was a learning process on how we listen to story and what story tells the listeners through language spoken and emanating from the storytellers gestures and facial expression. That was all awhile ago, in the very beginning of the CD dream becoming a reality. Before I could do the recording there had been months of reading and research to bring the stories to life through thorough understanding of the setting and content. Google images, library hours, family documents, historical reference books, and some field trips to actual sites. Time on Ancestry.com, historical sites, museum sites and art exhibitions and then the writing, thinking, talking it out and multiple rough draft tellings of each story. In the end I recorded seven stories and selected Tim VanEgmond www.timvanegmond.com to record hammered dulcimer music between tracks as a story break. This works much like a palate cleanser at a wine tasting, the snippets of music are a simple way to give the listener a moment to soak in the story before moving on to the next. I decided to do this after listening to every storytelling CD I could get my hands on. I took notes while listening. I liked having a moment to breathe before jumping into the next story and I hope my listeners do too! The CD cover art process was a learning experience as well. I wanted to exemplify the art work of my Great Great Uncle and that meant getting copyright permissions. The front cover art is from the White House Art Association. The Abraham Lincoln portrait is the most iconic use of his art ,having produced this image of the popular President after three days of preliminary sketches done in the Presidential office. The portrait hangs today in the White House. The back cover has a black and white image of his Rembrandt style self portrait from the Metropolitan Museum of Art in New York City. With the permissions granted and the CD cover approved, fees paid the cover was becoming a reality. I chose a 6 panel cover to be able to showcase additional art and to properly thank all involved in this project. Anticipation ran high as I awaited the delivery of the cases of CDs. I was planning a launch party and needed the CD there to make its official debut. I had given allowed extra time because it was December and shipping and all other work seems to get bogged down in holiday agendas. Finally on a snowy December 2013 day I hold one in my hands. I couldn’t wait to share them with my family and peers. Now we were ready to party! I rented the firehouse banquet hall and planned some light refreshments and a Champagne toast with my brother and guests to Great Great Uncle George, to art and to the untold stories now shared. I used the stage there to showcase a couple of the stories on the CD and had a table for CD sales set up. I even considered the proximity to the holiday and provided a wrapping station. The CD is born, but that is not an end just a start to a new chapter. Now it is a schedule of CD promotion I am working on. I have done a radio show and placed them in the local book store. I am covering my social media accounts and taking them with me to performances. I have sent courtesy copies to reviewers, award organizations and to the people who helped make it possible. A storytelling CD is not a big money maker. 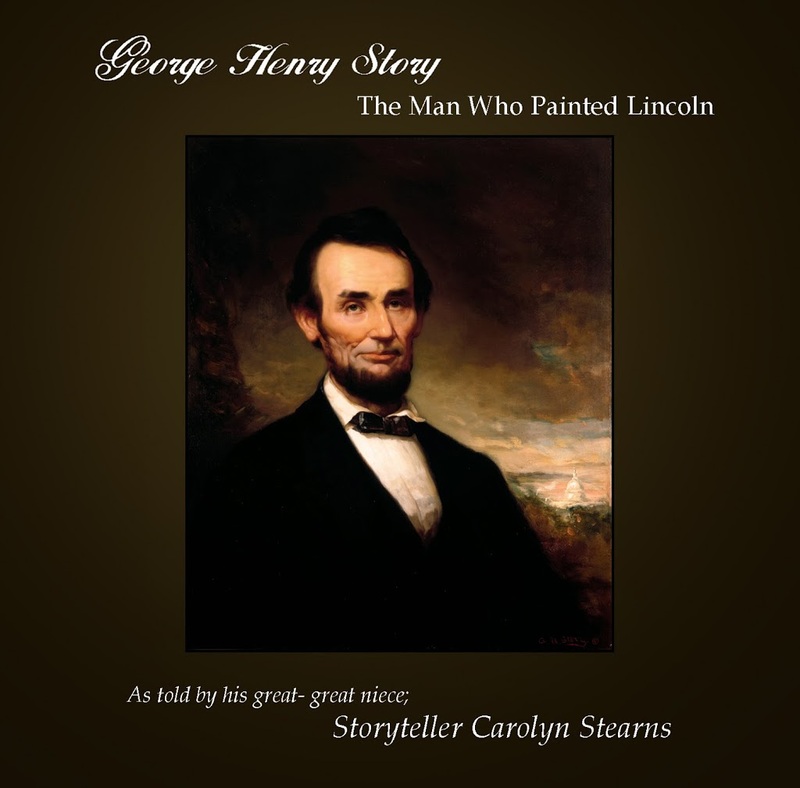 They are sometimes referred to as the ” new business card” In this case the CD “George Henry Story – The Man Who Painted Lincoln” is a legacy. It was time for the world to hear his stories so carefully preserved and passed down through multiple generations, it is time to renew interest in his art. The legacy of the man named Story is his story. How fortunate that my career as a professional storyteller allows me to share it. Maybe it’s not fortunate maybe the name has a genetic implication! and many more as well!